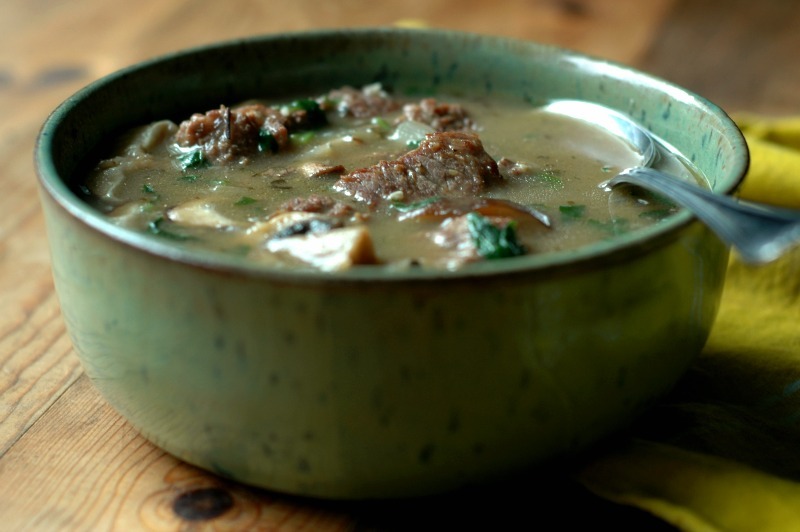 Savory steak & mushroom soup will become your staple comforting bowl of warmth this fall and winter! That’s what fall and winter are all about right?! 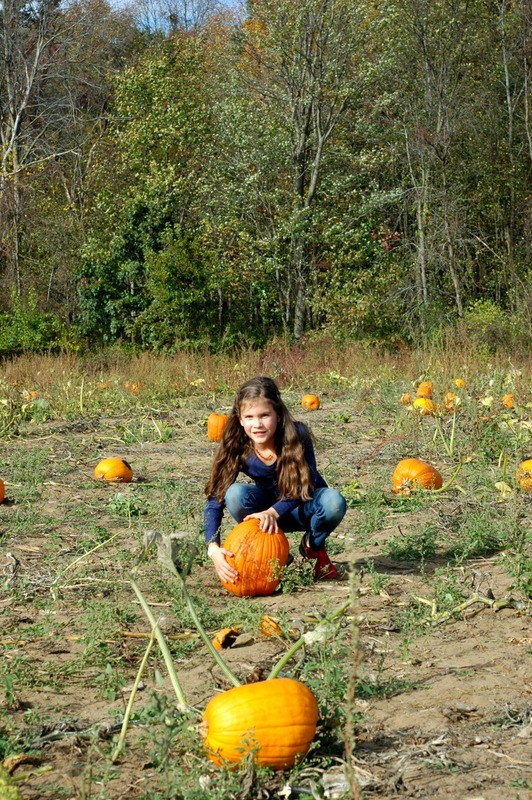 We’ve been enjoying an unseasonably warm fall so far, which make for really fun fall hiking, or pumpkin patch days! But with the sun going down a bit earlier each day, the cool air settles in by dinnertime, and that, dear friends calls for warm bowls of soup to end the day! Last week I introduced you all to Nourished Kitchen’s Roasted Mushroom Broth that I have completely and utterly fallen in love with this fall. I’m so thankful to have discovered this broth at the beginning of “soup season” so that I can enjoy trying it out in new meals all fall and winter! Steak & Mushrooms…like a match made in heaven! I don’t know of anyone that wouldn’t take a steak and mushroom dinner every day of the week. 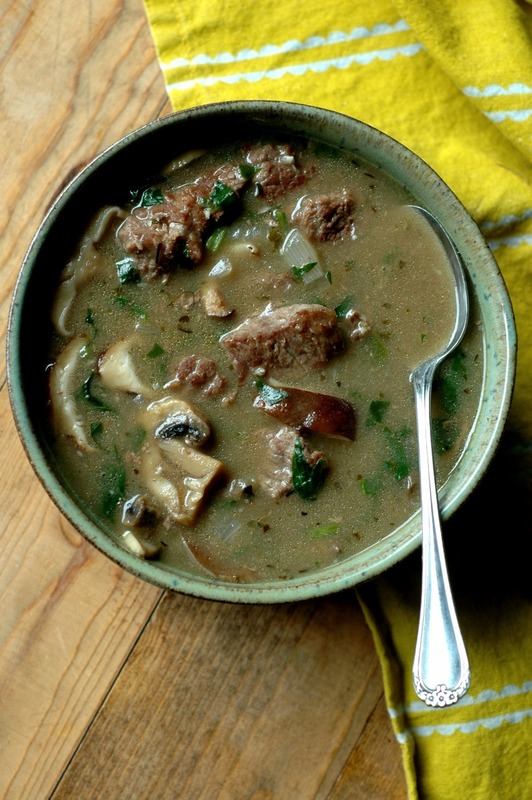 Getting those mushrooms down into a golden braise with warm ghee or butter sends this bowl of soup over the top. The extra nourishment from the roasted mushroom broth or using a collagen loaded beef bone broth boosts the nutrient level of this meal, making it something I’m definitely putting on my monthly meal menu this fall! 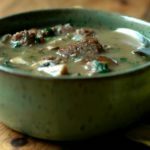 I know the idea of steak and mushrooms can feel kind of “heavy” but this brothy soup will feel comforting without the heaviness you would get from a big steak meal. Roasting the mushrooms for the broth makes this soup base feel so rich. It was such a satisfying and satiating dinner for a weeknight! I can tell you right now that my older babies would literally inhaled this soup! 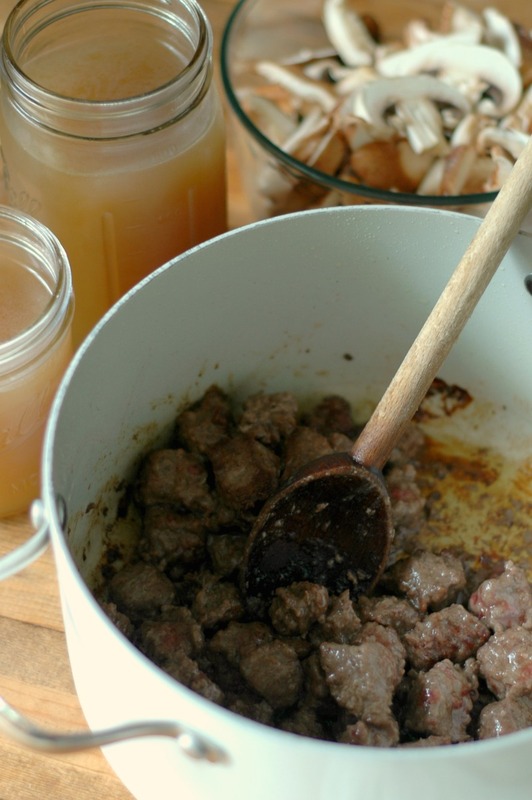 I very often made beef stew (in my cookbook Nourished Beginnings Baby Food), and chicken stew for my babies and blended it up for them – they were perfectly giddy with these meals! 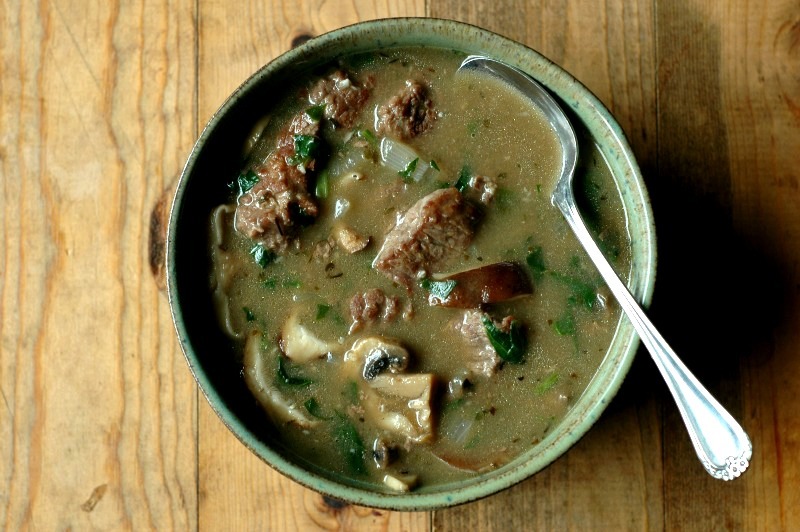 Those tougher cuts of beef like the steak in this soup are tough for little ones to chew though. Even my 4 year old needed her steak chunks cut a bit smaller to handle. 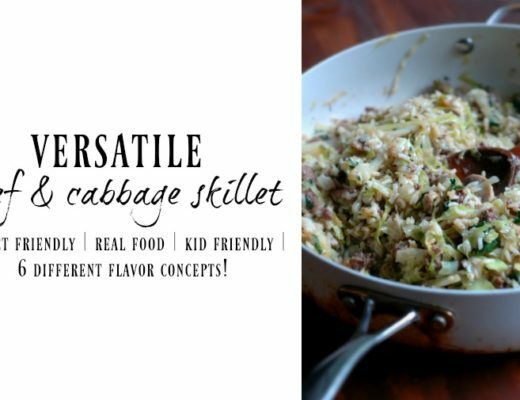 This would be a safe soup to start in pureed form for babies over the age of 6-9 months that have already tried tastes of beef and some veggies so you know they don’t have any reactions to the individual ingredients. You can pour mostly the broth base into a blender, Magic Bullet, or food processor along with a few of the veggies and a cube of the beef and blend it up. For toddlers that like to “do it myself,” puree half of his bowl of soup including the beef to make it a thicker soup. He can fist-full it, or use a spoon. You could also just put little pieces from the soup onto his tray to finger food and see if he will sip the broth from a cup. My little ones loved having little tea cups of broth! For older toddlers and preschoolers (even into those little guys in the Kindergarten and 1st grade ages), just make the beef chunks smaller. Even though the beef is really tender in this soup, it is just easier to chew that way for little mouths. To be honest, I made the steak cuts larger than I would have for photographing purposes for this post. When I make it again, I’ll be making the cubes smaller so my preschooler and 1st grader can handle them without needing take the beef out and cut it up more. Remember that little kids don’t like temperature extremes for their food. Their senses are so much more heightened than adults. Instead of serving piping hot soup to your little one, serve it lukewarm or even room temp. I have found my babies to go from completely refusing a food, to gobbling it down without hesitation simply by letting the food cool off to what I would consider cold! The perfect steak and mushroom soup accompaniments! Big salads with either Italian Dressing or this Copycat of the Olive Garden dressing – like a creamy Italian. And if the kiddos are more into those kid favorites, you can always do Ranch or Caesar! Heat the friendly fat in the bottom of your soup pot over medium/high heat while you toss the beef, 2 tablespoons of the arrowroot, salt, and pepper in a bowl to coat. When the oil is hot, carefully set the coated beef cubes in, searing the meat on all sides. Set the beef aside leaving the juices/oil behind in the pot. Over medium heat, add another tablespoon of oil along with the onions and mushrooms. Sprinkle with a big pinch of sea salt and cook over medium/medium-high heat for about 7 minutes, until the mushrooms and onions are softened and caramel in color. Add the garlic and cook for a minute, then add the coconut milk. Bring the coconut milk to a simmer for a minute or 2, and then add the last 2 tablespoons of arrowroot. Stir until everything thickens. Add the broth, seasonings, and seared beef to the pot and bring to a simmer. Keep the soup at a low simmer over low-medium heat for 10-15 minutes. Turn the heat off, and add the chopped spinach in to wilt, then and sea salt and pepper the soup to your taste. Oh wow, this looks incredible Renee!! I’m going to pin it to several boards so I can find it easily when I’m ready to make it, lol. Gorgeous!!! This soup is so perfect. 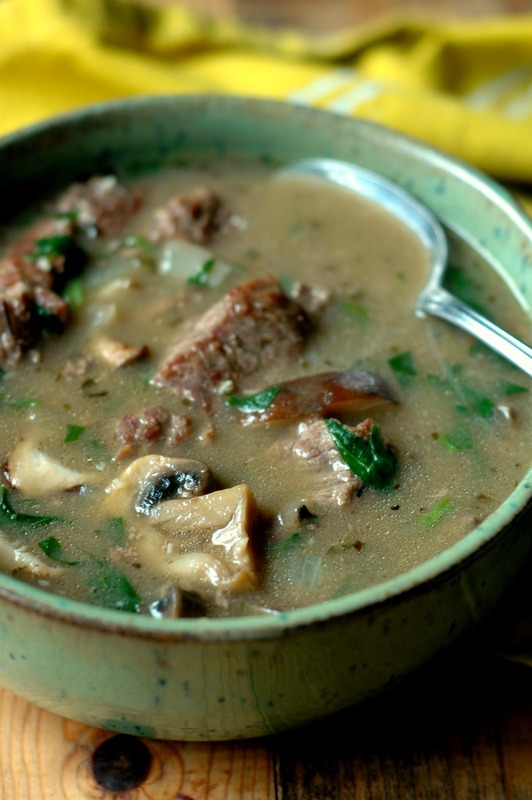 There’s nothing like steak and mushrooms, so special together … and that to soup, swoon! I need to make this soon. Love the photos of the girls too, so sweet. This soup looks so warming and comforting. I can’t wait to make it on a chilly evening! Love that you used coconut milk to make this creamy. Looks like a great soup for cold days and nights. Thanks for sharing! I’m in a serious soup phase right now. This is going down! Steak and mushrooms are pretty much my ultimate comfort food pairing, and I’ve been really into soups lately so I can’t wait to get going on this! It’s so chilly out this soup is perfect to warm up with! Simple and delicious ! 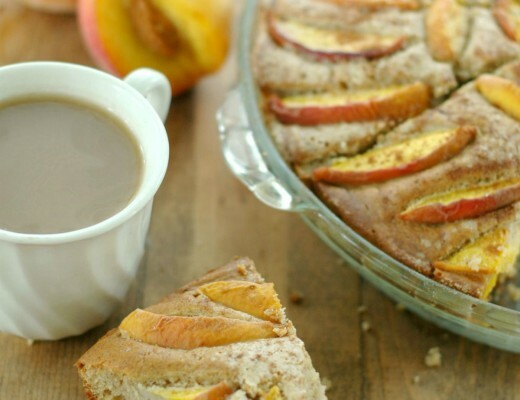 Perfect meal for colder months ! This is the ultimate comfort soup for cold weather. YUM!! I love a truly savory soup! So many soups are too sweet. Also, shiitakes are one of my very favorite things! I hope to try this soon. I just made it and it was delicious!! Such a great depth of flavor for a fast soup! 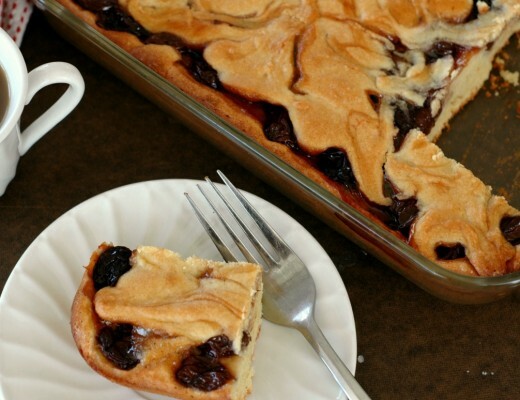 I used white rice flour and whole milk and my whole family loved it! Hi Laura! Great! I’m so glad you enjoyed it!